Jan 25, 2016 - Shlomit Krigman, 24, of Shadmot Mehola in the Jordan Valley, was fatally injured when two terrorists armed with knives infiltrated the community of Beit Horon. She died of her wounds the following morning. At about 5 p.m, two terrorists infiltrated the community and stabbed two women. A supermarket employee stopped them from entering the busy store, blocking the entrance with a shopping cart. A security guard shot and killed them. The terrorists, who apparently planned a combined attack using knives and explosives, were also carrying three pipe bombs. Shlomit Krigman, 23, of of Shdemot Mehola in the Jordan Valley, fatally injured, died of her wounds the next morning. The second victim is in moderate condition. 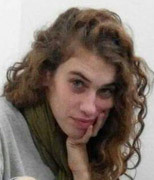 Shlomit was well-known and liked in Beit Horon, where she had performed her National Service as a group leader for the Bnai Akiva youth group after completing her high school studies in Tiberias. She was spending time with her grandparents there when she was killed. Shlomit recently completed her B.A. in industrial design at Ariel University, where for her final project she designed a mobile public library that would bring people together to communicate within the urban framework. A friend described her as good-hearted, caring and very creative. Shlomit Krigman was buried in the Givat Shaul cemetery in Jerusalem. She is survived by her parents, Yitzhak and Naama, and six brothers and sisters.